In, “Chicks, Fun and Trouble,” I told about the new chicks we received by mail. WSB asked for more pictures when they were grown. I took these pictures yesterday. 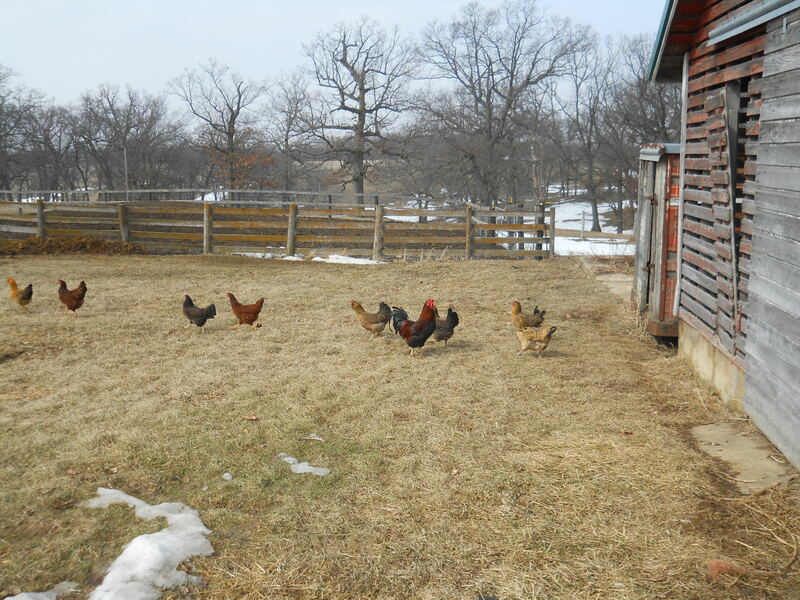 The chickens are enjoying getting out of the barn, scratching, grazing, picking up rocks for their crop. It’s been a long winter, stuck in the barn. Below are three of the chicks, grown. 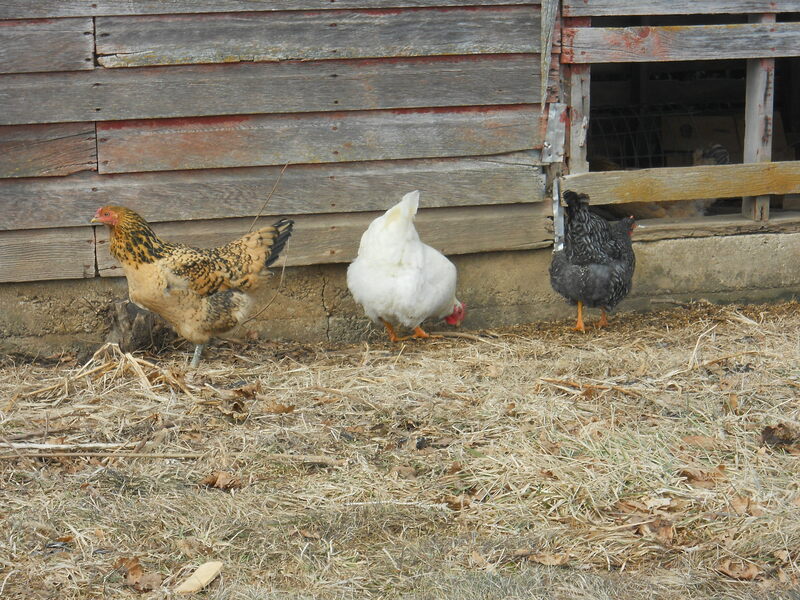 An Araucana, White Rock, and Barred Rock. They are laying beautiful, little, pullet eggs. Also, I want to say thank you to all the women in my life. Today is the 100th International Women’s Day. It was started in 1911 to honor the Suffragettes, who fought for womens’ right to vote. A turkey flew up out of the tall hay field right beside my tractor. I stopped the tractor and haybine and looked at the clutch of turkey eggs I had run over. Most of the eggs were broken and I could see half-developed chicks inside the broken shells. I looked at the freshly mown hay and realized this was just the first of many trips across this field. We had to rake, bale, and haul in the round bales of hay. And if the eggs were not run over by then, there was still no way a turkey would come back and sit on a nest that was out in the open. I opened the tool box on the tractor and spread out the grease rag. I found three eggs that weren’t cracked and swaddled them in the rag and went back to mowing hay. I had a Dark Cornish hen that was broody. I placed the three eggs carefully under the hen and she pecked my arm, but didn’t leave the nesting box. I checked the eggs every day. Most of the time I had to reach under the hen to check. One morning I heard a peep and spied a little head poking out from under the hen. I knew the poult would need time to dry off its feathers so I left it under the hen and waited until afternoon to check again. This time I moved the hen and found one strong poult, one dead poult, and one egg. The egg felt empty so I cracked open the hard shell. It was rotten. I carried the hen and the poult over to my brooder house so they wouldn’t be bothered by the other chickens. I set up a feeder and water for the hen and poult. The hen covered the poult with her feathers. I tried to catch the poult to make sure it knew where the water was and the hen ruffed up her feathers and attacked me. I kept the hen and poult in the brooder house for the next four weeks. They were doing fine. I decided it was time to let them out and see what they would do. The hen moved out into the yard and clucked to her poult to follow. After meandering through the yard eating grass and bugs, the hen took her poult into the chicken barn. The hen kept other chickens away from her poult. When I went to shut the door to the chicken barn at dusk, I was surprised to see the hen and poult roosting on the old dairy stanchion four feet above the ground. That little poult could fly and wanted to continue sleeping under the hen for warmth and comfort. As summer turned into fall, the poult grew into the turkey it was meant to be. Instead of sleeping under the hen, it would sleep beside the hen and put its head and neck under the hen’s feathers. It was larger now than any of the other chickens. But if the chickens noticed, I couldn’t tell. Once the snow came, I kept the chickens locked in the barn for the winter. I could tell the turkey was from wild stock because it was more skittish than the chickens. When the snow melted, I started letting them back outside in the daytime. The turkey really started to come into her own and express the urges she had felt all winter. She ran fast. She flew up into the tree limbs. She even flew to the top of the barn. She started to range farther in the field than the chickens. And one night she didn’t come back to the barn at all. 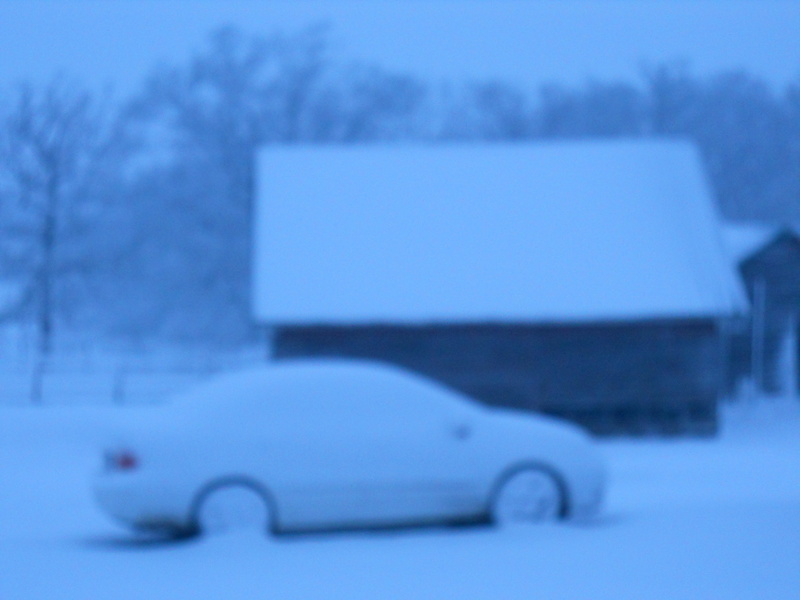 The next morning she was outside the barn waiting to rejoin the flock. But a week or so later she was gone again and this time for 36 hours. She continued to repeat this pattern until her absences grew longer and she never came back at all. But I thought I spied her with the wild turkey flock throughout that summer and fall. She had found her kind. Spring is here! Baby calves, baby piglets, planting oats, and 70 hour workweeks. Spring is the perfect thing to follow long winter hibernation. I feel I am a part of nature, not apart from nature. Do you have seasons in your life? My niece’s third grade class is planning on hatching chicken eggs and they asked me to furnish fertile eggs. I have been providing fertile hatching eggs to one class or another for several years. So far, everyone has had success incubating and hatching baby chicks from my chickens’ fertile eggs. I’ll explain my protocol. One rooster is recommended for every ten hens. House the roosters with the hens for at least two weeks prior to saving eggs. Save eggs for five days or less prior to incubation. Only select clean, well formed, normal eggs. I put fresh straw in all of the nesting boxes to ensure cleanliness. Store the eggs in egg cartons at 60 F. Elevate one end of the egg carton and switch ends twice a day. This prevents the contents of the egg from sticking inside the shell. Place all the eggs in an incubator and follow the directions. Embryos will not start to develop until placed in an incubator or a hen begins to sit on them. This is how a chicken can lay eggs over several days and still have all the chicks hatch at the same time. The natural option is to allow a broody hen to sit on eggs. A broody hen is one that wants to sit on a nest of eggs. Most modern chickens have the broodiness bred out of them as they stop laying eggs once they become broody. I still have some hens that exhibit broodiness and will allow some to sit on a nest and raise their own chicks. Everyone is excited when the chicks begin to pip through their shells. Sometimes a chick is not strong enough to break out of its shell and will die. An environment that was perfect for development becomes a confining prison resulting in death. Spring is here! Pip, pip, away! You are currently browsing the archives for the Curious chickens category.